Recently, I came across the original version of this Crusted Butternut Squash Recipe at Sprouted Kitchen. And even though it’s the middle of summer, I suddenly was overcome with a desire for this fall recipe. I made just a few tweaks, and was thrilled with how ridiculously delicious this butternut squash recipe was! The savory, seasoned breadcrumb mixture was the perfect accent to the mild, slightly sweet squash. This made a beautiful Weight Watchers side dish recipe that was not only lovely, but absolutely delicious and a fantastic way to get in a healthy veggie serving. I love the idea of serving it for the fall, but it was so darn good, I don’t think I can wait that long to have it again! 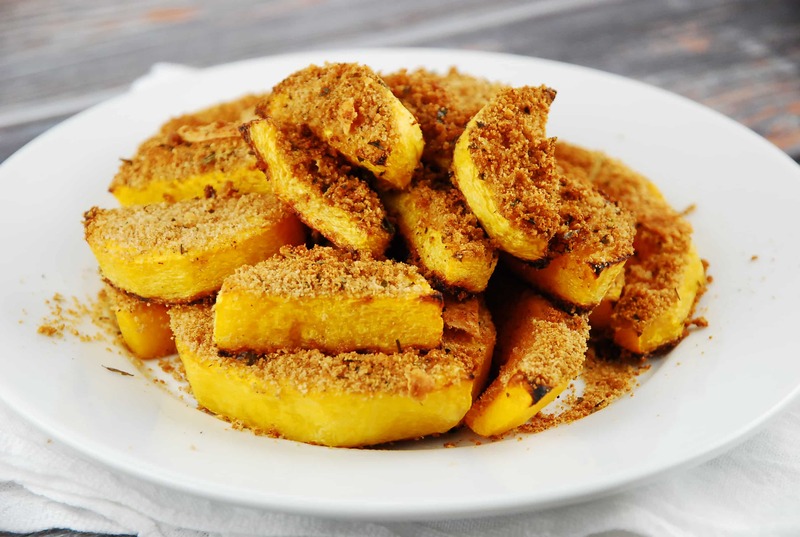 Tender, slightly sweet butternut squash topped with a delicious, savory seasoned breadcrumb mixture. A wonderful Weight Watchers Fall Side Dish Recipe that is tasty and nutritious. Preheat oven to 400 degrees. Line a large rimmed baking sheet with parchment paper and mist with cooking spray. Peel squash with a vegetable peeler. Cut in half lengthwise then scoop out all the seeds. Slice into 1/4” slices. Place squash slices evenly in a single layer on the baking sheet. Mist generously with an olive oil mister. Sprinkle the breadcrumb mixture all over the top of the squash. Then mist lightly with the olive oil mister. Place in oven and bake until squash is tender and breadcrumb topping is golden brown, about 20-25 minutes.